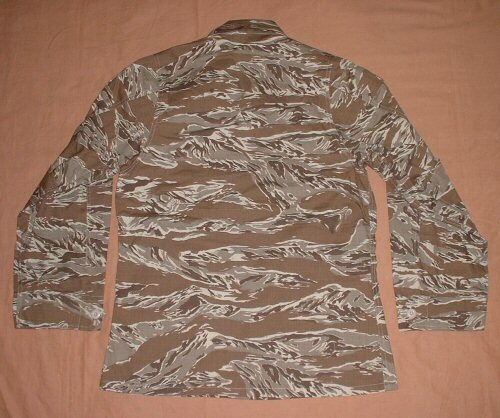 Improved specification desert tigerstripe BDU shirt in pre-shrunk 100% ripstop cotton. The desert tigerstripe pattern is an sand and brown coloured adaptation of the traditional 'jungle' tigerstripe pattern made famous by US Special Forces in Vietnam. Fabric is dyed through for colour fastness. 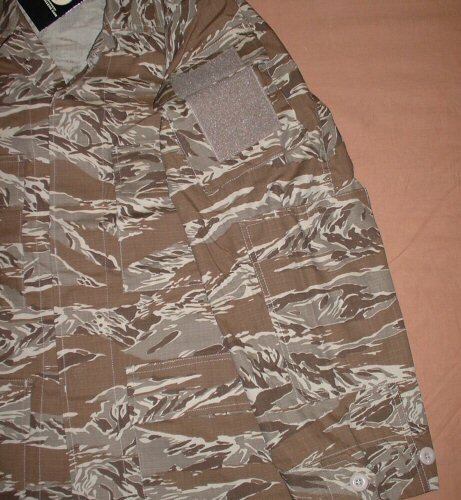 The enhanced desert tiger stripe BDU shirt features: four bellows pockets on front, upper arm pockets with velcro on both arms, central concealed-button down front, elbow reinforcement patches which open with velcro for the insertion of padding, classic BDU collar and tapered fit. 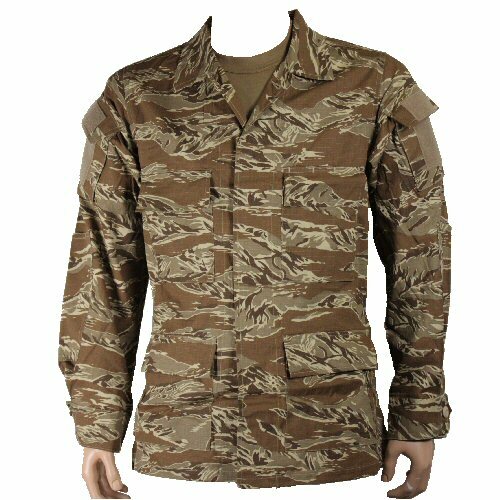 The four pockets make the shirt suitable for wear as a BDU jacket to be worn over trousers. Seams are double reinforced for durability. Sleeves have two stage adjustable button cuffs. 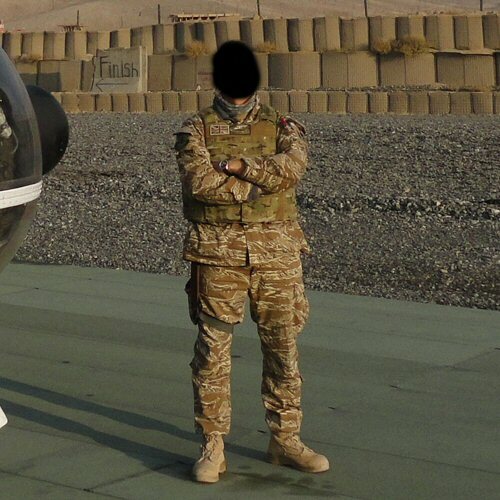 The desert tigerstripe pattern is favoured by US and UK special forces and is an excellent third option to the traditional British Desert DPM and US desert tricolour. Sizes run from Small (36inch chest, 65inch overall height) to XXL (54inch chest, 74inch overall height). Available options are: S , M , L , XL , XXL . Closer view of the arm, showing upper arm pocket with velcro patches for insignia, and elbow patch which can open with velcro to accept padding.